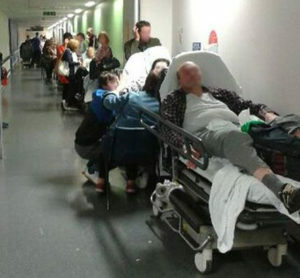 The future of the NHS and how a future government would re-build it should be a central electoral issue and be followed by open and full public consultation – Brexit should not determine how people are going to vote, says Keep Our NHS Public. This follows Labour’s announcement on 3 May  that the NHS would be a focus for them in the coming election, and that they would call a halt to the imposition of Sustainability and Transformation Plans (STPs) for the NHS, which KONP has opposed as cost-cutting measures and a means to allow more privatisation. KONP welcomes Labour’s move to stop the headlong rush to cut services and privatise, but also cautions against the risk of simply slowing down STP roll-out unless this is done with full and adequate public consultation and the money is found to ensure any moves do not further undermine an already critically weakened NHS after years of sustained under-funding. “We need a strong and stable NHS – not the Conservatives. They have destabilised the very foundations of the NHS over the last 7 years. They’ve drastically weakened standards of delivery of the NHS. The Tories are not working for the NHS – we are urging all who care about the NHS to ‘Vote NHS’ in this election. “We need a return to the stability of a publicly funded, managed and delivered health and social care service. A return to equality of access to excellent healthcare and freedom from fear about a return to paying for health bills.